Once my friends and family found out about the Hollandaise experiments in my class, they started talking about Eggs Benedict. I’ve heard of it before, but never had it…and this was my perfect opportunity to start experimenting on my family, using them as guinea pigs. While we were in class though, our instructor talked about how sometimes in restaurants when they’re making big batches of Hollandaise, they’ll make it in the blender. This floored me, so I asked how it was done….and tried it out. Just remember to keep the lid on the blender. I ended up with bits of Hollandaise in my hair. It’s the new style. 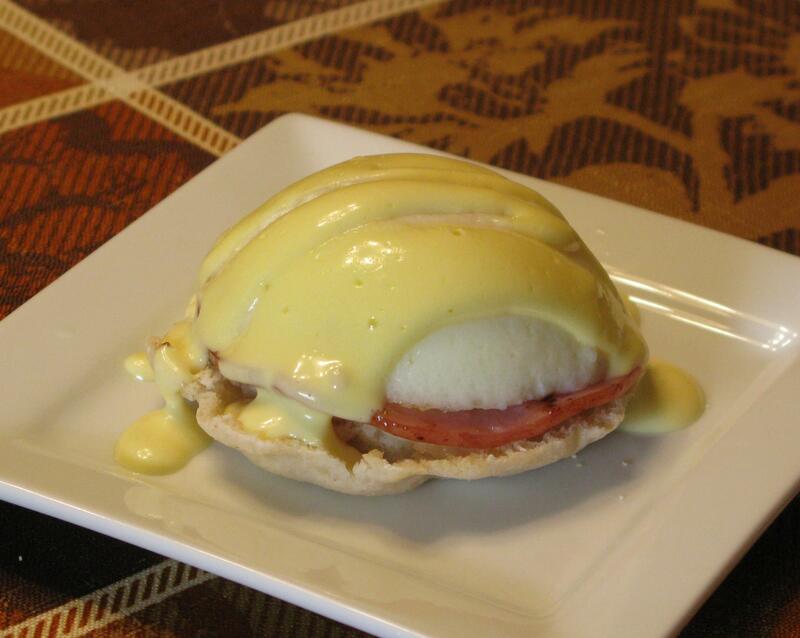 *Safety Tip: If there will be small children or elderly people eating the Hollandaise, use pasteurized eggs. (Pasteurize is to expose (a food, as milk, cheese, yogurt, beer, or wine) to an elevated temperature for a period of time sufficient to destroy certain microorganisms, as those that can produce disease or cause spoilage or undesirable fermentation of food, without radically altering taste or quality). Since I took the Food Sanitation course, I’m a lot more careful about germs and ways to prevent food poisoning in any way possible. Split muffins into two pieces each, making 8 halves. Lightly toast muffins in toaster or toaster oven. Melt butter in skillet on medium heat, sautee Canadian Bacon until lightly browned and crisp. Fill a saucepan with about 1 1/2 inches water, bring to a boil. Reduce to a simmer. Lightly spray poaching pod with cooking spray, crack open egg and put in pod. Place in pot of water and cover. Cook for 4-5 minutes, remove from water (they will overcook if you leave them in the water). Using a fork, remove egg from pod and place on top of Canadian Bacon on the muffin. Top with Hollandaise, serve warm. *You may want to practice this one or two times to get the right consistency that you want. Melt butter in small saucepan on low heat until completely melted. Once butter has melted, scrape the top thick layer off, using a spoon. This process is called making clarified butter (this makes a better consistency of the Hollandaise). Make sure the butter stays warm, 125-130 degrees. Place yolks and lemon juice in blender. With the lid on (don’t do what I did and end up with it in your hair), turn the blender on. After it’s running for about 10 seconds, SLOWLY start drizzling the melted clarified butter in the blender. Once all of the butter is added, stop blender to check consistency. If it’s somewhat thick (yet still pourable), add your seasonings and stir together. Drizzle over top of poached egg, Canadian Bacon and muffin.